A French/American mathematician Dr Benoit Mandelbrot discovered Fractals. The word fractal was derived from a Latin word fractus which means broken. Fractals are very complex pictures generated by a computer from a single formula. They are created using iterations. This means one formula is repeated with slightly different values over and over again, taking into account the results from the previous iteration. Astronomy − For analyzing galaxies, rings of Saturn, etc. Others − For depicting clouds, coastline and borderlines, data compression, diffusion, economy, fractal art, fractal music, landscapes, special effect, etc. Fractals can be generated by repeating the same shape over and over again as shown in the following figure. In figure (a) shows an equilateral triangle. In figure (b), we can see that the triangle is repeated to create a star-like shape. In figure (c), we can see that the star shape in figure (b) is repeated again and again to create a new shape. We can do unlimited number of iteration to create a desired shape. In programming terms, recursion is used to create such shapes. Geometric fractals deal with shapes found in nature that have non-integer or fractal dimensions. To geometrically construct a deterministic (nonrandom) self-similar fractal, we start with a given geometric shape, called the initiator. Subparts of the initiator are then replaced with a pattern, called the generator. As an example, if we use the initiator and generator shown in the above figure, we can construct good pattern by repeating it. Each straight-line segment in the initiator is replaced with four equal-length line segments at each step. The scaling factor is 1/3, so the fractal dimension is D = ln 4/ln 3 ≈ 1.2619. A fractal is defined as a rough or fragmented geometric shape that can be split into parts, each of which is approximately a reduced-size reproduction of the complete shape based on the property known as self- similarity. It was derived from the Latin word fractus which means broken or fractured. 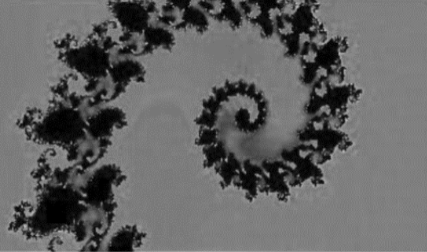 Natural objects can be realistically described using fractal geometry methods. Eg.- cloud, mountains, trees, stone etc. Fractal methods use procedures rather than equations to model objects. so it uses procedural modelling.The major characteristic of any procedural model is that the model is not based on data ,but rather on the implementation of the procedure following a particular set of rules. a) Its parts have the same form or structure as a whole, except that they are at a different scale and may be slightly deformed. b) Its form is extremely irregular or fragmented, and remains so, whatever the scale of examination. Eg: if P0 = (X0, Y0, Z0) is a selected initial position, the successive levels P1 = F (P0), P2 = F (P1), …… Pn = F (Pn-1) are generated by a transformation function F.
These fractals have parts those arc scaled-down versions of the entire object. In these fractals object subparts are constructed by applying a scaling parameter ‘s’ to the overall initial shape. It is a choice of user to use the same scaling factor ‘s’ for all subparts, or use different scaling factors for different scaled-down parts of the object. Another sub class of self similar fractals is statistically self-similar fractals, in which user can also apply random variations to the scaled down subparts. These fractals are commonly used to model trees, shrubs, and other plants. These fractals have parts those are formed with different scaling parameters. sx, sy, sz ,in different co-ordinate directions. In these fractals,we can also apply random variations to obtain statistically self-affine fractals.These fractals are commonly used to model water, clouds and terrain. In these fractals, nonlinear transformation is used, It includes self squaring fractals such as the Mandelbrot set. Which are formed with squaring functions and self inverse fractals, form with inversion procedures. Consider an object composed of elastic or clay. If the object can be deformed into a line or line segment we assign its dimension Dt = 1. If object deforms into a plane or half plane or disk we assign its dimension Dt = 2. 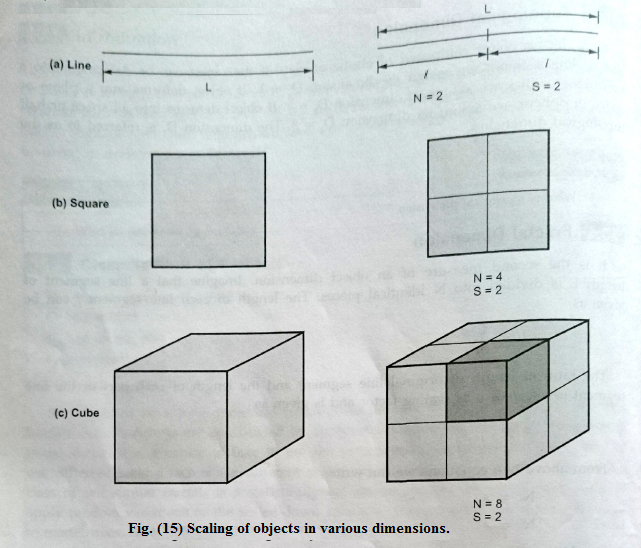 If object deforms into all space or half space or sphere, we assign its dimension Dt = 3. The dimension Dt, is referred to as the topological dimension.